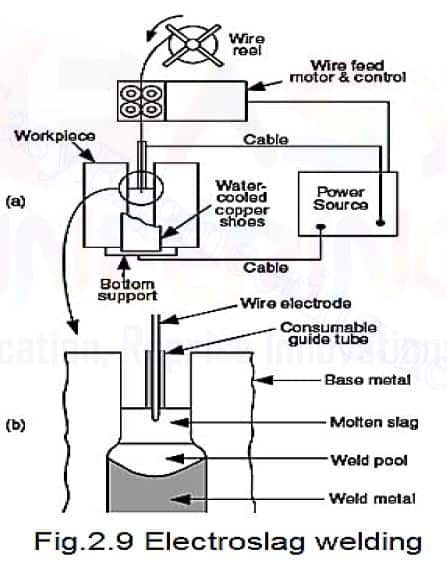 Electro slag Welding is a welding process, in which the heat is generated by an electric current passing between the consumable electrode (filler metal) and the work piece through a molten slag covering the weld surface. Prior to welding the gap between the two work pieces is filled with a welding flux. Electroslag Welding is initiated by an arc between the electrode and the work piece (or starting plate). Heat, generated by the arc, melts the fluxing powder and forms molten slag. The slag, having low electric conductivity, is maintained in liquid state due to heat produced by the electric current. The slag reaches a temperature of about 3500°F (1930°C). This temperature is sufficient for melting the consumable electrode and work piece edges. Metal droplets fall to the weld pool and join the work pieces. The weld pool is contained within this space and—due to contact with the copper blocks—it cools, solidifies, and is shaped. Electro-Slag welds are started and finished on run-off plates. This is known as starting or finishing tabs—they improve the quality of the weld metal. Circumferential seams can be welded by the electro-slag process, using special devices to overcome the difficulty of joining the start and finish of a weld. The bead on the reverse side can be moulded by a water-cooled copper chill-ring, a permanent steel-ring, or a travelling shoe. Pieces of variable cross-sections can be electro-slag welded using consumable electrode guides. An A.C. or D.C. power source in the range 300-800 amps is suitable, as used for automatic and MMA processes. Electroslag welding is capable of welding plates with thicknesses ranging from 50 mm to more than 900 mm and welding is done in one pass. The current required is about 600 A at 40 to 50 Volts although higher currents are used for thick plates. The travel speed of the weld is in the range from 12 to 36 mm/min. Weld quality is high. This process is used for large structural-steel sections, such as heavy machinery, bridges, ships and nuclear reactor vessels. Unlimited thickness of work piece. Only vertical position is possible.